NOTE: The audio player should appear below, if not, please click on the title of this post and go online to hear. Dissonance. Sounds bad, right? Like when we sing a harmony note that's not in the chord, or press an elbow into the piano, or play two scales exactly a half step apart at the same time. It just sounds wrong! But used well, dissonance also has the power to move us! Bear with me, this is a vocal lesson - you'll understand as we go. A tension or clash resulting from the combination of two disharmonious or unsuitable elements. Dissonance can be present from the micro to the macro - from intracellular activity of stress and illness to societal disfunction and war. It can be both disturbing and powerful when present in music, alarming and strategic when present in the voice. Let me tell you the story that got me thinking about this. My husband John, son Peter and I went to hear our truly outstanding Nashville Symphony on this season's opening night at the Schermerhorn. John was formerly a percussionist in the Memphis Symphony and Peter thought it was high time we three attended together, to see an orchestra at work and see what his father used to do. We thought we were going to hear Brahms. But before that gorgous concerto, we were treated to a a mind-blowing work by contemporary composer John Corigliano - his Symphony No.1. Hear the He has won 4 Grammys, a Pulizer Prize and an Oscar Award, and serves on the composition faculty at Julliard. Corgliano and our 6-time Grammy winning conductor Giancarlo Guerrero met the audience in a conference room for 'Conversations' where they introduced themselves and told the stories behind the music the orchestra was about to play. John Corgliano's symphony was about rage, remembrance, sadness and finally, closure for the lives of the victims of AIDS, including three of his musician friends who had died of it back in the 80's when it was first diagnosed. To really 'go there', Mr. Coriglano used some unique staging and instrumental choices... for instance, the very busy percussion section was in front of the brass. The horns were split at both sides of the stage instead of together; there were two timpani; and for one section, the violins used mandolin picks instead of bows! Dementia is one of the ways AIDS tortures its victims. Periodically, a piano located off stage where we couldn't see it could be faintly heard as a pianist played an old tune in such a way to depict memories that would fade, reappear, then fade again - all while the orchestra continued to play. Throughout the work, there were sounds of sudden percussion bursts, chords dissolving like melting wax, and oh my there was DISSONANCE! From time to time it seemed like some sections would play in one key and some in another... and there was purposeful unsynching of rhythm. Overall the effect was so incredibly emotional. The composer and conductor had warned us there would be an orchestral 'primal scream'... and they did not disappoint! You could feel the rage, sadness and insanity. We would have loved to have seen the score! Finally as the music simplified, you felt it come together like waves of the ocean in eternal release. ... dissonance moves you forward. I was instantly struck by that phrase. Googling it, I read many sites which talked about cognitive dissonance, and the need to resolve it for happiness and mental/psychological health. Isn't dissonance what we fear? Is it not cousin to chaos; doesn't it conjure up the frustrating moments of 'this-does-not-compute'? Yes, but the very discomfort and tension of dissonance makes you want to resolve it! If you let it, it can move you forward. The musical genres that most influence my own songs and style include singer/songwriter (ala James Taylor/Carol King), r&b, bluegrass, traditional country, rock and classical art songs. I know, I'm a musical mutt! However, I have always loved the ear-cleansing dissonant music of Bela Bartok such as his 'Suite For Piano'. (No, I can't play that now!) It feels like fresh cold water on my musical imagination and frees me to be more creative in any genre... it even inspires creativity in my teaching! The most interesting atonal music requires great skill, and has a math logic to it! Like great expressionist painting, at first sight (or listen) great atonal music can seem to be completely chaotic with no order. However, as per former classical radio host Bob Weir's explanation, totally random dissonance is not as interesting as structured dissonance. 12-tone music is explored in this delightful though hyper-speeding video by the artist known as Viheart. Sometimes, as in the above piece, the music never resolves. It can suggest moving forward, and let that happen in your imagination, your intention, or the next song. It's a good factor to take inconsideration when creating set lists for your gigs, or song sequencing for your recording projects. Strong lyric writing in any genre often paints a problem situation and then moves the listener to resolve it. One of my rock students and I discussed dissonance of the lyrics of Pierce The Veil's 'Low On Gas and You Need A Jacket'. They are full of rage, many lines make no sense at face value. She said these kind of lyrics move you to stop accepting things the way they are. After listening to the Sara Bareilles song She Used To Be Mine about the dissonance between who you've become and what you wanted to be, it seems to me you would firmly resolve to find your authentic way again. In Jennifer Nettles song Stay, the truly dissonant situation of being involved with someone in relationship with another makes the lyrics lead to the phrase 'I don't have to live this way', and powers the will to let go and move forward. Great producers can use dissonance to help new talent create their unique artistic definition. Instead of just recording the songs the singer is familiar with, the producer will take the budding artist through a period of exploration, pushing the person's envelop vocally, lyrically and musically. Wildly going to outer edges of the person's musical boundaries creates a dissonance that will eventually resolve into a unique meld of music that best expresses the artist's heart, vocal talent and life experience, and best focuses the career direction of the artist. You look at the landscape of the music business and see how things are not working the way they used to... profit is not created the same way and music makers are struggling to find streams of income that they can live on. It's so unfair that creators are stolen from every day in every way. The dissonance must lead to creative solutions as the music industry continues to morph its successful business models. You can get stuck and give up, or show up to learn what is different, what is working, and how to creatively structure your own music business model which won't break your bank. Because dissonance creates the desire for movement, it can be of great use in vocal training. I always say 'the voice wants access to movement'. When I get my students creating free jaw, eye and soft palate movements it frees the voice to move in more nuanced, human ways. This releases tension in the areas that has kept the student's voice stuck. Also, controlled dissonance can be great for hearing and singing with pitch precision. One of my more advanced pitch exercises is to have a student sing exactly 1/2 step sharp or flat to a melody or scale I play for them. It's quite the challenge even to the expert ear! In fact, vocal problems create dissonance. You need to be confidently delivering messages, but your throat hurts when you sing or speak, you develop pitch problems or range limitations, or your speaking engagements are wearing you out. 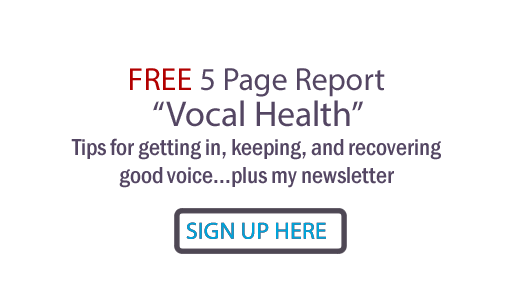 Enough vocal dissonance will move you forward to learn new technique and resolve your issues for your vocal health and career. You are singing a song with great vocal technique, but it's boring. It's a strange dissonance that is asking for MORE dissonance to be able to move you and your listeners. This kind of dissonance asks you to consider some things that may be outside your comfort zone. You can try a moment of 'dropping technique', dropping your breath support, letting your throat channel tighten, using gravel or other stylistic tactic. Then re-apply your technique and resolve the grit into open vocal tone and control for an emotional delivery that can really takes the audience for a thrill ride. I heard Bruce Hornsby do just that recently. One of my students (John Mailander) is in his band, so I went to see them in Nashville. He came out singing like a bird after a short section where he was scratch-talk-singing, like he had vocal trouble. Turns out he was just using dissonance to move the heart of the listener forward! Your physical body can be affected by dissonance, too. You eat something that your gut does not recognize or wish to tolerate. Your body resolves the issue with some sudden elimination, and you then can either keep your diet the same, or resolve not to eat that again! Relationships can be dissonant. You have a fight with a friend or loved one. Everything inside you wishes to resolve the conflict until peace and relationship is restored. Cognitive dissonance can create spiritual and ethical issues. You claim a certain faith or political orientation, but you don't live your day to day life according to the values your faith or politics espouse. Your cognitive dissonance will make you feel numb, fake, fearful of being exposed and unable to be true to yourself or to others. You can never fully experience personal happiness, contentment and peace ... nor the ability to trust others, until your faith and your actions are in harmony with each other. You can stay stuck or move forward. History is chock full of dissonance, its consequences, and its resolutions. I can only imagine the degree of dissonance in society that lead up to ratification of the Women't Right to Vote and the Civil Rights Act. South Africa's Nelson Mandela chose to take the dissonance of apartheid and move to the resolution of reconciliation. Dissonance can move us forward. The alternative is getting stuck in chaos. One soul's dissonance is another soul's awakening. The deeper reason I wanted to dive into dissonance is that I feel there is a frightening degree of it in the world right now, and it is tempting to buy into a frozen hopelessness. It's a fine line we walk between sticking our heads in the sand and becoming overwhelmed. I invite you to use the energy of dissonance to make our music, to sound our voices in song and speech, to join the heart of God to change the world for the better as we are moved to do so. On my podcast you will hear an ending of one of the sections of a composition written by my husband, John. I hope his last chord makes you smile as it does me. Listen to some dissonant music. Whether or not you 'like' it, ask yourself how it affects you. Does it disturb, energize or otherwise move you? Google the term 'cognitive dissonance' and explore that concept. List where in your music, voice or life you are experiencing dissonance. How can it move you forward? There is so much more to be said on the subject of dissonance. I'd love to hear your thoughts in the comments! Also... if you enjoy this blog, sign up for updates to it and my newsletter by filling in this box. Thank you, Judy, for such a thoughtful and thought-provoking article. Catherine, thank you for taking the time to let me know. It did take some time to write; I'm so happy you enjoyed it! Great article Judy! You pretty much nailed it. Dissonance makes us take notice, and can make us long to move to the resolution, or we can rebel against it (shut out the dissonant elements) and stay stuck. When we listen to, or play/sing music that has dissonant elements, our brain wants the music to move to the resolution...it's the same for non-musical (cognitive)dissonance. It causes a need to be curious and open about what we're thinking. Then we can either choose to move toward resolution, or shut it down. I really appreciate your feedback, glad this made sense to you! I do hope this post causes some deeper curiosity out there and awareness that we all need to do critical thinking in every realm to make the world a better place. Thanks again! Judy, this is a remarkable and uplifting article from someone who really appreciates that it’s not a “dumbing down” or oversimplification of a fascinating and complex subject. 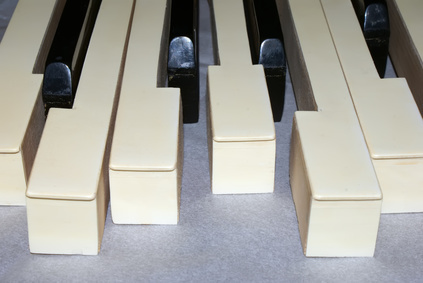 I studied piano through college, even though as a biology major, I was in labs so much that sometimes the only time I got in front of a piano was the hour of my lesson each week. But I was particularly drawn to your compelling argument about the value of dissonance because I have found myself hating the current cultural and political dissonance and wanting to withdraw from it all instead of staying engaged. You have inspired me to reframe my reaction and value dissonance as a tool for moving towards a more satisfying end. Thank you so much for this very thorough and thoughtful piece. Elizabeth, you have made my day. This is EXACTLY what I hoped the response would be... I wanted it to inspire and reassure that even chaos can be used for the good. Bless you for staying engaged. The world needs you! I don't much like dissonant music, but I so agree that dissonance is always the awakening to something else that brings harmony to the forefront.